Reserve A Friendly Forest Today! We recently stayed here for a girls trip, it was 5 of us total and the cabin was nice and cozy, especially the master suite. I would stay here again. We had a good time, the hot tub came in handy. We didn’t use the loft as we aren’t pool players but it is a nice amenity to have. We couldn’t get the fireplace in the living room to work or the tv in the smaller bedroom but everything else was fine. The only other thing was the driveway, it was a little nerve wrecking getting in and out with a minivan but we made it happen. OverallI would give it a 9 out of 10. Our stay was our 11th year in a row staying in Pigeon Forge for a girls weekend and this cabin was by far our absolute favorite! It had everything we needed and more! So roomy and comfortable for the 5 of us to stay in and relax for a few days! I would stay here again! Over and over. And the ability to check and also check out by using my phone?!?! Top notch service!!! Thank you! The cabin is just as they explained. It's beautiful!! We will definitely stay at this cabin again. Our family really enjoyed our time here! Would recommend this cabin to everyone. Will do my best to rent this cabin again when I’m able to return to the mountains. Spacious cabin had everything you could ever need in the kitchen. Comfortable beds, clean, quiet. We had deers around the cabin 2 mornings. Just a great weekend. Had absolutely no problem just what we were promised. Friendly staff at the office. Will be back. We stayed at friendly forest. We loved this cabin, although there were some issues we ran into. First, the downstairs bedroom smelled musty, so I sat an air freshener on the vent and it helped it. Second, there was a cleaning issue that I called about and it got taken care of. Third, the hot tub cover was too small, but we made it work. Also, it was waterlogged. The directions were a little off but we managed to locate the cabin pretty easily. The driveway is at an angle and gravel so it’s a little slick when it rains. And also, the pull out sofa needs to be replaced or something. We spent 20 minutes the first day trying to get it back in the couch. So we didn’t use it. The pool table felt needs replaced. On the plus side, the cabin location was perfect. It’s far enough way from all the bustle of the city but close enough that you didn’t have to drive forever if you needed something. The beds were so comfortable! And the master bathroom, I could have spent my whole week in there and it wouldn’t have bothered me one bit. The decks were perfect to sit on while it rained (it rained the whole week we were there). It was soothing. It took us a little bit to work the TV but we finally got Netflix pulled up since there’s not many channels. I would recommend this cabin if the above mentioned were fixed. There wasn’t a lot of pots and pans either but we made it work. The cabin itself is beautiful and spacious. Even with all the cons, we still loved it. When we contacted the office over the cleaning issue, they were amazing to get it worked out for me. Thanks CabinsUSA for yet another amazing vacation. We enjoyed our stay at "A Friendly Forest". I actually felt like we were staying in a Forest. The directions were easy but difficult to find the house in the dark. We arrived at the house late evening and took us 20 minutes to figure out the location of cabin. Anyways Cabin was up to our expectations. The best part is the master bedroom. The master bedroom mattress needs replaced. The master shower needs new weather stripping. The water ran out under doors. The filter in master bedroom needs replaced. Pictures could be updated. There were beer cans and trash all underneath our cabin. We had cobwebs all behind the stand up mirror in the master and the lamps. The cabin was beautiful and nicely decorated. We loved the master bedroom & bathroom! The jacuzzi tub is absolutely wonderful! The hot tub was a hit, especially with our 3 teenage daughters. There was plenty of space for the 5 of us. We enjoyed the pool table and foosball. The beds were comfy. We liked the location, not too far from town. We loved everything about this cabin. We would definitely stay here again! A great place to stay! Can’t wait to come back. The place was very nice, however the beds need updated. They are wore out, when you can feel the springs it’s time to replace. The patio furniture needs updated. And a small table outside with the chairs would be nice. It would be great to have chlorine tablets let for the hot tub as well! The most helpful thing would be a book or binder with helpful information.. like how to operate the alarm system, how to operate the tub in the basement. Just basic information like that! The cabin needs to be cleaned like deep clean. Thank goodness I took my disinfectant wipes to wipe down the kitchen area. I question proper cleaning being done at this location. Another thing people should know is the game room, with its location on the top floor it made it very noisy!! We were hoping for better view of the mountains too, this property you only see the trees in the woods. Previous guest decided to throw beer bottles and their white bath towels over the ledge therefor when looking out at the view you saw this. I would have thought the cleaners would have gone down and cleaned that up before our arrival. However we made the most of the things that bothered us! Very nice cabin. Would stay there again. Distance between pigeon forge and cabin was not a bad drive. Cabin felt very homey. Needs more silverware and glasses, the king size bed might be needing replaced soon. Couch was not very comfortable either. Could use a deep cleaning soon found a few cob webs. Overall I would give it an excellent rating just minor things. Hot tub was amazing. Jacuzzi tub was awesome. Views are there just could use some trimming if the trees around the cabin. Overall I would stay again at this cabin. Cabins USA are very easy to work with and would recommend this company again. This was my anniversary weekend and we wanted time together in these beautiful mountains. Let me say that Cabins USA (Tiffany) made this a awesome stay. She went over and above to see that this stay was the best ever. Thank you Tiffany. The Cabin called The Friendly Forest was everything we wanted, very clean, cozy, and our stay was the best. We have already shared with lots of friends about this amazing experience we had at Cabins USA. We will be back for sure. Thank you all, Blessings, The Branam,s. I always enjoy the smokies whenever I visit. The cabins makes the stay even more enjoyable. A Friendly Forest made my birthday stay a total success. I'll be looking at this cabin the next time I visit the smokies. Our family has stayed here several times in the past. This time it was just me and the husband. We had a wonderful, peaceful week. The view and location are hard to beat. Will definitely be staying here again. We had a great time at this cabin! This cabin does not have a mountain view but we knew that when we rented it. The name A Friendly Forest is exactly what you get! Definitely would stay again! It was very clean, spacious and private. A few recommendations that I have: 1. Place a post with the address closer to the road. 2. Fix the driveway - either add more rock or pave it because there are two large holes that made it very difficult. 3. Directions on how to use the fireplaces would be nice. 4. The pool table needs to be leveled and have the felt replaced. 5. The upstairs bedroom only had 3 channels that the television would program. We had a great time and will definitely do it again. The customer service that was provided was fantastic! Wish the screen doors were replaced. One was missing and one was broken. The hot tube should be be cleaned more often. Other then that the place was absolutely beautiful and on point. Will definitely be returning to one of these cabins again! The cabin was nice, however the hot tub was not working when we arrived. We called for service and the lady asked me to put breaker back in breaker box outside, then hot tub worked, however it was very low on water so I called service back and the lady was quite rude. My husband and I ended up carrying bowls of water from the sink to the hot tub until it had sufficient water. I received a text stating they had to order a part to fill the hot tub and when we left 5 days later we still hadn't heard from anyone regarding hot tub. I feel when you save to go on vacation and book a cabin that has amenities they all should work. There were numerous light bulbs burned out and a lot of cob webs on back porches. The driveway is terrible, we had a full size truck and it was hard to maneuver in the tiny driveway that was a half circle with a tree in the middle. Kind of disappointed in this rental, however probably would give the company another chance. Note: Pictures online have to be from years ago, because the trees are so grown up in back of cabin you can't see anything. This cabin is beautiful. The outside photo that is shown is an old photo. There are lots of trees around the cabin now which aides in shading the cabin and making it feels as if it's farther back in the woods. We had a minor issue with the fuse in the hot tub being blown which was handled quickly. Just for future reference the refrigerators will take a few hours to cool down due to the previous tenant having to turn them off when checking out. We had 6 people in the cabin and had plenty of space and never felt crowded. I would highly recommend this cabin to anyone. The cabin is really nice ! We loved the master bedroom and bathroom !! We used the deck upstairs a lot. We wished there would have been a better view from the deck. However it is a nice wooded/ sky view. Very relaxing ! We really only had 2 real complaints. We were unable to access the wifi in the cabin. The router worked but was not a secure network. We called the office and they were not much help. Our other complaint would be the driveway. The tree island in the middle of the driveway needs to go. It would make it much easier to park and exit. Overall we were very satisfied and would love to return ! Thank you for taking the time to let us know about your recent stay in A Friendly Forest! We strive to give each the guest the same great stay you experienced while vacationing in the Smokies. I apologize for the issues you experienced with the WiFi. Your comments have been forwarded to our maintenance department to be addressed. Thank you for choosing Cabins USA and we look forward to having you as our guest again! The cabin was beautiful (liked the color combination). We are coffee drinkers, so please remember to bring your own coffee filters. Two issues; (love seat and king size mattress) you may want to replace them both because they are worn and uncomfortable. One other thing, the tv in the front bedroom was not working. The driveway was manageable as long as you know how to maneuver. The washer and dryer was a blessing. Yes, we would recommend others to share the experience. Thank you for taking the time to let us know about your recent stay in A Friendly Forest! We here at Cabins USA work hard to make sure each of our guests have the same great stay you enjoyed while vacationing in the Smokies. Thank you for letting us know about the love seat and mattress. Your comments have been forwarded to our Owner Liaisons and they will be bringing this to the owner's attention. When you are ready to stay with us again, please mention you are a return guest for an additional discount. Thank you again for your review and thank you for choosing Cabins USA! The cabin was exactly as described. It was a wonderful stay and experience. The driveway was a little tricky but it certainly didn't set back our opinion of the overall stay. We only stayed for a short vacation, but we really enjoyed the time we spent at "A Friendly Forest". The cabin was beautiful, the furniture was comfortable and the neighborhood was peaceful. We had an issue with the tub in the master bath, on our last night. We reported it at checkout, the staff was very apologetic and assured us that it would be fixed. We would definitely recommend Cabins USA to friends and family. I am so happy to hear that you enjoyed your stay in A Friendly Forest! We here at Cabins USA work hard to ensure each of our guests have the best stay possible while vacationing in the Smokies. When you are ready to stay with us again, please mention you are a return guest for an additional discount. Thank you again for your review and thank you for choosing Cabins USA! I rented from Cabins USA in November and loved the cabin we had, but this cabin is so much bigger I truly enjoyed the space and layout of this cabin. The cabin is absolutely wonderful. We enjoyed our stay very much. I had trouble starting the fireplace because I had never worked a gas fireplace like this one. A set of instructions would have been helpful. We had an issue with the downstairs bathroom, but maintenance was out that day and addressed the issue right away. I will be coming back to Cabins USA again! This cabin is awesome! We actually plan on booking again pretty soon. Only issue we have that I would forewarn about is using a GPS to get to the cabin. The address provided for the cabin is incorrect and will send you to the wrong place which was a dead end. So make sure to use the directions they give after you check in. Thank you for taking the time to let us know about your recent stay in A Friendly Forest! We here at Cabins USA work hard to make sure each of our guests have the same great stay you enjoyed while vacationing in the Smokies. When you are ready to stay with us again, please mention you are a return guest for an additional discount. Thank you again for choosing Cabins USA and we look forward to having you as our guest again! Thank you for continuing to choose Cabins USA when you visit the Smokies! We work hard to make sure each of our guests have the best stay possible. Thank you again for choosing Cabins USA and we look forward to having you as our guest again! I will definitely go back there again. Thank u so much. When you are ready to stay with us again, please mention you are a return guest for an additional discount. Thank you again for your review and thank you for choosing Cabins USA! We loved the downstairs bedroom and bathroom but we had to take the back off the toilet every time we wanted to flush it because it kept getting hung up. The main floor bedroom was not a good bedroom for anyone...the TV would only get two stations and the bed seems like a double rather than a queen, and there was nowhere for clothes to be hung. Additionally, a breaker kept tripping causing downstairs to lose power, the wall going downstairs had something gross left on it from previous guests (? ), the living room furniture needs updating. I can't stress enough how much we loved the layout downstairs and the 2 balconies. everything was great! One thing I would mention is that the wifi info we received was outdates. We got a name and password and that's apparently not used anymore. The cabin was very clean, however, there was a bad smell around the stair area going downstairs. It was worse when someone flushed a toliet or took a shower. My husband thought it might be sewer gasses leaking back into the cabin. My parents actually had this problem when and had to get their pipes fixed. Wonderful stay. The only problem we had was with downstairs shower (it didn't work). Otherwise our stay was awesome. It's very clean and beds are comfortable. Quiet location and easy check in/out process. Our second stay with cabins USA. Will book again in the future. i am so happy to hear that you enjoyed your stay in A Friendly Forest! We here at Cabins USA work hard to make sure each of our guests have the same great stay you enjoyed while vacationing in the Smokies. I apologize for the issues you experienced with the shower. Your comments have been forwarded to our maintenance department to be addressed. When you are ready to stay with us again, please mention you are a return guest for an additional discount. Thank you again for your review and thank you for choosing Cabins USA! We stayed from August 6th to the 14th. The place is beautiful. I would stay again. With that being said, there were a few things that we had issues with. The first night we had maintenance in to fix the alarm sensor that would not quit beeping. About half way through our stay the ceiling fan in the master shorted out and exploded one of the lights, again we had to have maintenance come, which resulted in not being able to use the light in the fan. (the master is pretty dark) On arrival we were looking at everything and found 2 dirty towels hanging on the back door of the upstairs bathroom and also noticed that the carpeted areas were not swept (or they really need a new sweeper, found food and debris). The grill is in need of major repair or maybe just replaced. But as I stated the locations is wonderful and we would stay again. We had a very nice stay and enjoyed the cabin. It is a beautiful cabin with plenty of space and amenities. The kids loved the pool table and foosball. We spent many hours in the hot tub after hiking. Our main complaint however was that upon arriving there was a loud beeping noise that occurred about every 2-3 minutes. We searched for a while assuming it was either related to the security system or a smoke alarm. We thought maybe a battery was dying in an alarm and having to deal with that for the entire stay would have been very annoying. We checked in at 4pm. We called the office around 6pm after unpacking and the noise continuing and were told maintenance would give us a call and come out to take care of it. No one ever called or showed up. At about 11pm we finally tracked the noise to a motion sensor that seemed to be having a dying battery. We basically had to cover it up so the noise wouldn't be heard. We were not going to disable their property but staying for three nights and having that noise every couple Minutes would have been awful. Not sure what happened with maintenance but they didn't contact us the entire trip. That was disappointing and not something we should have had to spend so much time trying to solve. Other than that the cabin was beautiful and well taken care of. This is a beautiful cabin. It feels like you are staying in a treehouse. Very peaceful. The cabin was very clean. The water pressure was amazing and there was no problem with the water heater. My only complaint would be the driveway. I have a full size pickup and it was a tight squeeze. My suggestion to the owner would be to cut back on the tree island in the middle of the driveway. But thanks to these reviews I knew that coming in and I was prepared. We had a wonderful time ounce again and Thank Cabins USA for another great summer vacation. We are already planning our next stay. If you are a nature lover this is the cabin for you. The cabin was beautiful. We really enjoyed our stay. We loved our stay at a Friendly Forest. The master bedroom downstairs was gorgeous and complete with a beautiful bathroom and whirlpool tub. We spent some time in the hot tub outside which was super nice. The game room loft upstairs was perfect for our son (and us)! The place was gorgeous and very clean. The one thing we were a little disappointed in was the master bedroom carpet was soaked when we got there...it looked like the tub had overflowed and it had been cleaned with carpet cleaner. We called to report it and were informed the maid service had already reported it and it has been cleaned. What we were dissatisfied with was that we weren't informed on the front end. It didn't change our view of the place and we still had a blast and would go back, but it would have been nice to know before getting our socks all soggy unexpectedly. Thank you for taking the time to let us know about your recent stay in A Friendly Forest! We here at Cabins USA work hard to make sure each of our guests have the best stay possible while vacationing in the Smokies. I apologize for the issues you experienced with the carpet. Management will be working with guest services and dispatch to ensure our guests have all the information they need when they check-in. When you are ready to stay with us again, please mention you are a return guest for an additional discount. Thank you for choosing Cabins USA and we look forward to having you as our guest again! Loved the cabin! The only problem that we had was with the wifi. The first day it worked great, but after that it was either really slow and not working at times. As mentioned in other reviews, the driveway definitely needs some work. We really enjoyed our stay at the cabin and will be using Cabins USA again!!! Thank you for taking the time to let us know about your recent stay in A Friendly Forest! We here at Cabins USA work hard to make sure each of our guests have the best stay possible while vacationing in the Smokies. I apologize for the issues you experienced with the WiFi during your stay. Maintenance has been notified and will be looking into that issue. When you are ready to stay with us again, please mention you are a return guest for an additional discount. Thank you for choosing Cabins USA and we look forward to having you as our guest again! The cabin was great we enjoyed our stay only thing we didn't like was the bedroom on main floor the tv didn't work and the water pressure in the shower downstairs could be a lot better to enjoy the jet sprayers but over all loved and enjoyed the cabin very nice !!! Thank you for letting us know about your recent stay in A Friendly Forest! We here at Cabins USA work hard to make sure each of our guests have the same great stay you enjoyed while vacationing in the Smokies. Your comments about the television and water pressure in the cabin have been forwarded to our maintenance department so they can be addressed. When you are ready to stay with us again, please mention you are a return guest for and additional discount. Thank you for choosing Cabins USA and we look forward to having you as our guest again! Wonderful cabin in a great location. Remote, but only ten minutes from light #3 on the main strip. Driveway could be better. Thank you for taking the time to let us know about your recent stay in A Friendly Forest. We here at Cabins USA work hard to make sure that each of our guests have the same great stay you enjoyed while vacationing in the Smokies. when you are ready to stay with us again, please mention you are a return guest for an additional discount. Thank you again for your review and thank you for choosing Cabins USA! The cabin was very nice and clean. The only thing I was disappointed in was the furniture in the main living area. The sofa and love seat were very uncomfortable and worn out. They definitely need to be replaced and maybe add another chair that is comfortable. Other than the things mentioned, it was lovely and we would definitely stay again. Thank you for taking the time to let us know about your recent stay in A Friendly Forest! Our cleaners work hard to make sure that each of our cabins are thoroughly cleaned and fully stocked so all our guests have to do is walk into their cabin and start relaxing. Thank you for letting us know about the sofa and love seat. Your comments have been forwarded to our Owner Liaisons and they will be speaking with the owner of the cabin regarding this. When you are ready to stay with us again, please mention you are a return guest for an additional discount. Thank you again for your review and thank you for choosing Cabins USA! Other than issues with heat and fireplace it was good. The staff who came to fix heat were good. I would suggest that directions for fireplaces and all electronics be posted or in some type of notebook would probably decrease calls. As mentioned in comment book needs new couch and especially master mattresses . Cabin was clean and pretty would stay again if these corrections were made. Thank you for taking the time to let us know about your recent stay in A Friendly Forest. We here at Cabins USA work hard to make sure that each of our guests have the best stay possible while vacationing in the Smokies. Thank you for your suggestions. Those have been passed on to management so they can be addressed. When you are ready to stay with us again, please mention you are a return guest for an additional discount. Thank you again for your review and thank you for choosing Cabins USA! The jacuzzi didn't work but they gave me money and 25% off next time ty so much place was so nice .!!!!! I am happy to hear that you enjoyed your stay! We here at Cabins USA work hard to make sure that each of our guests' issues are handled in the best way possible so they can enjoy their visit to the Smokies. Thank you for choosing Cabins USA and we look forward to seeing you again soon! We loved the cabin. Disappointed it wasn't seasonally decorated (Christmas). The indoor jacuzzi needs directions because there are so many options, its not just on and off and the label is no longer on the unit. We really loved the hot tub and we used it several times everyday although it didn't feel as hot as other tubs we have used. We wished it were a bit more private, with all the leaves gone its like being in everyone's back yard. The one screen is worn out and needs replaced. Its a little picky I guess but the upper windows need cleaning, they look nasty. The driveway is a bit rough and could use a good scraping or paving. Directions to the cabin are a bit misleading, its closer to 8/10s of a mile to the second Cub Circle than 5/10s of a mile as described. An alarm at a nearby cabin went off for several hours until we finally called someone. That doesn't say much for the security system, security or response times. Checking in online like some other companies would be an added benefit, really liked your checkout procedure. We've stayed in a number of cabins through many agencies and never stayed in the same one twice. We may stay at A Friendly Forest again. All in all we loved our stay. Thank you! Thank you for taking the time to let us know about your recent stay in A Friendly Forest. We here at Cabins USA work hard to make sure that each of our guests have the same great stay you enjoyed while vacationing in the Smokies. Thank you for letting us know about the cleanliness of the windows. This will be forwarded to our housekeepers to ensure this is taken care of . We do now offer our guests express check-in, so our guests can go directly to their cabin. When you are ready to stay with us again, please mention you are a return guest for an additional discount. Thank you again for your review and thank you for choosing Cabins USA! Cabin was not well equipped . Kitchen was not equipped for use - 4 spoons are not enough. Main floor bedroom TV did not have cable box (or instructions on how to use TV). Hot tub was clean and great to use! House isn't high enough in the mountains for the best views, but not bad. Front door lock malfunctioned - could not lock the door as we left (bad battery). Cabins USA maintenance was excellent - even after hours! While we did enjoy our stay at A Friendly Forest the cabin could use some TLC. Check in and check out are a breeze and are a welcome upgrade to the cabin rental process. Upon arrival we found that the driveway could use some serious work. One might consider removing the tree from the center and using that space to make a nice even driveway that would allow multiple vehicles to be parked in front of the cabin. The gas fireplace in the living room would not light and it was late the next day when we finally got a rep on site to get us going (we called the first day but no one showed). We also had the rep replace multiple light bulbs throughout the cabin. The mattresses could also be replaced. We found them to be downright uncomfortable. The kitchen was very sparsely stocked with cookware and utensils. I have stayed in other cabins within in the same area and never had this issue. We did enjoy the atmosphere, the seclusion and the hot tub immensely. This is a really nice cabin located in a great setting it just needs a little upgrade in a few areas to take it from nice to excellent. Also...kudos to Geno's Pizza...they will deliver to the cabin at darn near midnight in the middle of a rain storm...excellent pizza and speedy friendly service!!!! Other than it raining the whole time we were there, we had a great time and will be back! I am so happy to hear that you enjoyed your stay in A Friendly Forest. When you are ready to stay with us again, please let our reservationists know you are a return guest for an additional discount. Thank you again for choosing Cabins USA and we look forward to seeing you again soon! Thank you for choosing Cabins USA again for this trip to the Smokies. I apologize that no one followed up with you about the issues you experienced with the hot tub. This is definitely not typical. We will be speaking with our staff and stressing the importance of following up with each of our guests. Thank you again for your review and thank you for choosing Cabins USA! The kitchen needed to be stocked with cooking utensils and cookware. The jacuzzi was also messing up but other than that we had a great experience. The cabin is beautiful. Thank you for taking the time to let us know about your recent stay in A Friendly Forest. We are always striving to give our guests the best stay in the Smokies and I am happy to report that new kitchen items have been purchased for this cabin. When you are ready to stay with us again, please let our reservationists know you are a return guest for an additional discount. Thank you again for your review and we look forward to seeing you again soon! I gave the clealiness of the cabin a 9 instead of a 10 because in the master bedroom, there were 100s of dead flying ants in the carpet along the wall. I felt that housekeeping could of vacuum that up before we arrived. I can expect some bugs and spiders getting in because the cabin is literally in the woods. Other than that, it was very clean. We will definitly come back to this cabin. THank you for taking the time to let us know about your recent stay in A Friendly Forest! I apologize for the issues you experienced with the insects in your cabin. We did notify pest control and are happy to report that the issue has been resolved. When you are ready to stay with us again, please let our reservationists know you are a return guest for an additional discount. Thank you again for your review and we look forward to seeing you again soon! Beautiful cabin located in a private setting offered accomodations for a family up to 7. The exterior of the cabin was less eye appealing than the interior. Several cobwebs and dirty windows, but it provided a rustic feel. The cabin could use a good spring cleaning on the inside and out. Several of the light bulbs were out and it was a bit dusty. In regards to cleaning- the cabin was average and was not dirty, yet did not sparkle. There are very little kitchen appliances so do not plan on cooking while you stay here as you will not have what you need. For a one night's stay it was good and my family enjoyed it. The hottub was nice as well as the downstairs jacuzzi and shower. I would recommend this cabin, but please remember you tend to get what you pay for so do not expect 5 star accomodations. It was beautifully decorated on the inside. The only reason I did not do all "10's" was because even with a special rate of $66 per night, the price was still $400 for the weekend. Those extra fees are crazy! Just include it in the nightly rental somehow so when we get such an awesome B2G1 deal, it doesn't go back up with all those misc fees. Kinda gave me a false sense of a good deal. Clean, roomy for our family of 5, and we had a wonderful stay. Our small children enjoyed the fireplace and game room. Likely to stay again! We were beyond pleased with this cabin! It was even better than expected. We've never rented a cabin before and I was a little nervous because I'm very picky about the cleanliness of places we stay but this exceeded my standards. The Christmas decorations were very basic but they were all we needed. My kids were pleased & that was all that mattered. We were very comfortable during our stay & had everything we needed. The only problem we had was that no channels picked up on the tv in the kids' bedroom, but we weren't at the cabin enough for it to matter. We thoroughly enjoyed our stay & will book with Cabins USA again in the future! We have rented cabins from Cabins USA for the past several years and this cabin was a favorite!!! I did read some reviews about how bad the driveway is but...this one is a piece of cake compared to others!!! just a little on the small side. My husband and I were celebrating out 25th wedding anniversary and this cabin was perfect!! Actually more room than we needed and we loved the very large master bedroom and bath!! Beautiful and fun cabin. The game room and hot tub were wonderful after our day hikes. Very spacious and comfortable. Friendly staff. We got to the check in building later in the evening exhausted. The staff who checked us in was super friendly and gave us a lot of information about the area. The directions were in general great, except for the fact that they said we were the first cabin on the left, yet we were the 6th. But that's because the other cabins were owned by other companies I think. The cabin? I could live there, and we all settled in almost immediately to enjoy the week! Very clean, laid out nice, and was simply the getaway we needed as a family! Thank you for taking the time to write your review. We are are glad that you and your family enjoyed your time with us at A Friendly Forest. We appreciate your feedback on your stay and the cabin. We have the issues you did address taken care of. We hope to hear from you again soon. Do not forget we offer a return guest discount. beautiful cabin, great location. other than the queen mattress in guest bedroom (time for a new mattress) and a roar from the DVD player (couldn't watch DVD, the noise was too loud)... it was a great place to stay and i will probably go back. Thank you for choosing Cabins USA. We are delighted that your enjoyed your stay with us at A Friendly Forest. We apologize for the inconveniences you did experience, and we have them looked into. We appreciate your feedback, and look forward to hearing from you soon. I have never rented/ reserved a place on line before. The site was very easy to negotiate thru. The girl at checkin was very friendly. The written directions that we received when checking in were a little confusing on trying to find the cabin for the first time. Other than that had an excellent experience. The cabin was beautiful. I repeat beautiful. Way better than I pictured. This was a surprise girls weekend for my daughter and niece for their high-school graduation. They were totally impressed and excited about the cabin. They were especially excited about the HOT TUB. I have already recommended the cabin on facebook and included your phone number. We are all talking about returning and will definitely rent from you again. Thank you for an excellent experience. The cabin was great and CabinsUSA was great. The driveway was a little tricky to get in and out of. Our cabin, A Friendly Forest was AWESOME!!! The only negative was that we didn't have any internet service for the entire stay. A service person came to check it out and never came back. Also, the TV in the main living area didn't work---he looked at this too and never fixed it. Everything was wonderful! But I should've listened to the other reviews and gotten a different cabin because that king mattress is absolutely HORRIBLE!! Friendly Forest is a great cabin, it was clean, beautiful, comfortable and very romantic. Highly recommend this cabin to others. We will most definitely return...Thanks Cabin USA!!! We loved this place! It was great and we'd most like consider your company next time we are in Tennessee! I loved the cabin itself. Here are the "buts": Checking in took a little longer than I expected even though there was only one person ahead of me. They wouldn't just give me the paperwork to do while they finished with the first customer so it took longer than necessary, but I may be impatient and the staff was very friendly. I don't think leaving a tip envelope for the cleaners is in good taste considering I just paid close to $100 for cleaning and other vague fees for only a couple of days. Someone needs to go clean the ground below the cabin, there are red plastic cups everywhere which must have fallen off the porch and it kind of spoils the woodsy feel. The pictures very carefully omit being able to see any other cabins, but there are a few around you can see from the front and back, but overall it's still pretty private. I was a little annoyed there were no coffee filters, since there are different kinds and sizes, that isn't the kind of thing you can know ahead of time and bring. I had to make a trip into town just for that (I left them, you're welcome next person!!). The cable didn't work at all, but I didn't feel like dealing with the stress of making calls and spoiling a day waiting for someone to fix it. It also would have been nice to have WiFi so Netflix would be possible. The kitchen was definitely lacking in decent cookware. The pans were all sort of warped and there was not a single decent knife but since I'd read that in another review I brought my favorite pan from home. Otherwise, I loved the cabin, it was cozy and warm and pleasant. Would go back but will probably try a different place next time! My family and I have been visiting the Smokies yearly for the past 7 years. I was the most pleased with A friendly Forest cabin more than all the others I have stayed in. 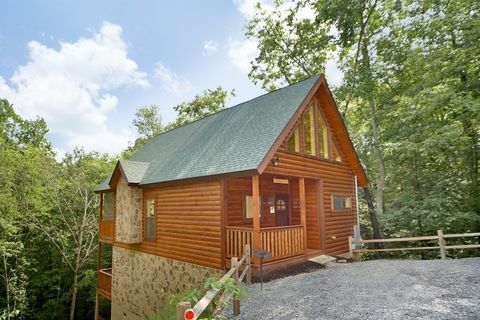 Cabins USA is definitely at the top of my list to recommend to my friends and family that also visit TN regularly. Thank you for an amazing cabin, the memories that my family and I left with are lifelong! Wonderful Cabin if only we had more time to spend in it!! it would have been nice to have had a few days just to spend in the Cabin thats how much we liked it!! We have stayed in several different cabins over the years and used several different rental companies. This cabin by far was the nicest and cleanest. A clean cabin is VERY important to me and this cabin meet my high expectations. It has a working fireplace in both the living room and the master bedroom. The game room with a pool table and foosball table. The master bathroom is gorgeous, with a jetted tub and seperate shower. Also, Cabins USA was awesome, easy check-in and out, and nice employees. I would highly recommend this cabin and rental company. I will be trying to book this same cabin every year!! We really enjoyed our vacation at "A Friendly Forrest" ! We spent Christmas with our family there! I was so happy they had a Christmas tree up in the cabin for us. We enjoyed the fireplace and jaccuzzi! The view was peaceful. The pullout needs another mattress(springs are shot), and the king master bed was not very comfortable. In the kitchen the dishes need replacing and they need new pans if you plan on trying to cook. The only thing that could have made our trip better would have been having it snow! FYI- we didn't have cell phone service AT&T: but that was a good thing! :) Totally unplugged! The only problem we had was with the cable on both tv's and the fireplace upstairs. After we arrived we were only able to get a couple of channels. The cable box up stairs was not plugged into the tv so we called the next morning. We were told someone would come and check on it that day. We were looking forward to watching our local college football team on ESPN the next night and we ended up going to a restaurant and watching it becasue no one ever came. The upstairs fireplace was not working either. We loved being tucked away in the trees and had a great time. We had a great time. My mom hadn't been to Pigeon Forge in 20+ years. This was a celebration of Mother's Day and her recent retirement. Will definitely keep you in mind for future rentals. Thank you! Check in was slow because it was busy but we enjoyed our stay at A Friendly Forest, nice cabin and good location. Too many fees included in the price though, for example, the administrative fee. I completely understand the cleaning fees though. We have been renting from CabinsUSA for the past 3 1/2 years and the cleaniness of thier cabins has gone done alot. The gentleman at the check-in office could use a course in customer service. The cabin itself was beautiful. The location was the best. We have rented many cabins from CabinsUSA. PLEASE re-evaluate your cleaning staff. We enjoyed the large T.V. 's in both front and bedrooms! We enjoyed our stay, however due to the cleaning crew's lack of cleaning, we will probably be trying other Cabin rental companies. We had to go out to Walmart, purchase ant/bug spray come back to cabin spray and clean up the dead ants and bugs. I thought CabinsUSA had an exterminator company to this this. I realize we were out in the wilderness, but ants/bugs can be controlled if sprayed on regular basis we had several bites from these. AGAIN, the cabin itself was very nice just needs to be cleaned better before being rented out. Tonya at office was great too! Absolutely perfect! So clean and beautiful with everything you could want for the perfect relaxing vacation! Will stay again at every opportunity! Loved the cabin. The master bed was uncomfortable, but other that that everything was perfect. Staff at check-in could have been friendlier. Mattress in master bedroom might need updating. Master bath was wonderful! Need to fix the lazy susan cabinet in kitchen and need more dishes (wine glasses, pyrex or corning wear dishes, wooded or plasitc cooking utensils). I did not enjoy getting harrassed by the time share people in the lobby at check in. We loved our stay at the "Friendly Forest". It was private and the cabin was beautiful. The only issues I had were the fact that we paid administrative (not sure what that is for) and cleaning fees which actually made our stay cost around $180.00 a night instead of the $79.00 per night advertised price. I'm not quite sure why the housekeeping left a note asking for a tip, when I took out my own trash, wash my own dishes, gathered my own towels and sheets, and made sure the cabin was in great condition before we left. If I had to do my own cleaning, plus pay a cleaning fee, why am I leaving gratuity? I think your company should reconsider the amount of fees. We noticed other cabin companies were advertising "no cleaning fee", and lower administrative fees while we were in town. This does effect how often we will come. We would like to make the trip 3-4 times a year, but extra cost brings us in town 1-2 times a year. Making money is the point, and I understand, so with that being said...Thanks for a great stay! HAD AN AWESOME TIME, WE WILL BE BACK, IT WAS THE NICEST CABIN YET!!! We enjoy renting cabins through Cabins USA. Quality service! Great rentals! Thank you for choosing Cabins USA. We are happy that you had a wonderful stay with us at A Friendly Forest. We hope that you will keep us in mind when planning your next visit to the Smoky Mountains. Our stay at Friendly Forest was great!!!! We will share our memories from this stay for years to come! This trip to your area was a Wish come true for our granddaughter,she wanted her momma to see the Smoky Mountains before she died,her mother has pancreatic cancer.. Thank You for such a WONDERFUL CABIN AND SERVICE! Thank you for choosing Cabins USA for an important part of your life. We are very delighted that we provided you with a wonderful experience during this time. We hope that we will see you again soon on your next trip to the Smoky Mountains. What a beautiful cabin. My husband and I loved it. We enjoyed being off the beaten track yet close enough to Pigeon Forge to visit the attactions. We look forward to coming again. Thank you for choosing Cabins USA. We are delighted you that you enjoyed the convenience and beauty of A Friendly Forest. We look forward to seeing you on your next visit to the Smokies.